Interview with Claudia Salerno, Venezuelan Ambassador to the EU: “We will not accept an external agenda”. The eyes of the world are once again on Venezuela. After being appointed president of the National Assembly on January 23 opposition leader Juan Guaidó proclaimed himself the “temporary president” of the Venezuelan government. The United States and a group of European and Latin American countries immediately expressed their support, basing his legitimacy on Article 233 of the Venezuelan Constitution. 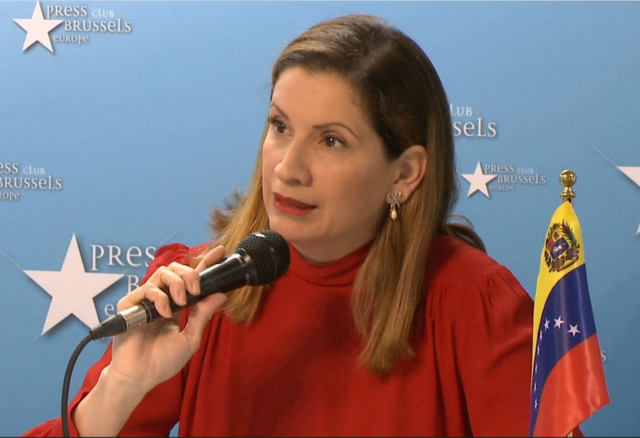 The issue is that Guaidó says President Nicolas Maduro is a “usurper who has abandoned his post,” while the Supreme Court of Justice has already declared any decision by the National Assembly “null and void.” In this context of great urgency and international pressure on her country, Ms. Claudia Salerno, Venezuelan Ambassador to the European Union, has granted us an exclusive interview. Hers is a voice of dignity breaking through the media’s all-out assault on Venezuela. Alex Anfruns: The governments of 19 European Union (EU) countries gave Venezuela an ultimatum this past Monday, February 4: either call for presidential elections within eight days, or they will recognize Juan Guaidó as temporary president of Venezuela. What is your reaction to that statement? Claudia Salerno : Our president Nicolás Maduro and our Foreign Minister Jorge Arreaza have given a clear answer. Venezuela is a sovereign country, with its own system of laws and a Constitution in force, adopted in 1999, which clearly establishes the mechanisms for calling elections. There is absolutely nothing in the national Constitution of the Bolivarian Republic of Venezuela that establishes elections at the behest of European countries. We have been independent for more than two hundred years, we do not take instructions from Europe. It is scandalous that Europe should stoop to this illegal recognition. In practice this means nothing more than supporting the person designated by the United States to carry out a coup d’état in Venezuela. That [intent] has been clearly stated by the US government through all its spokespersons—from President Donald Trump to his Secretary of [State]—that armed options are on the table in order to bring about regime change. So the EU’s call for elections is nothing more than parroting Donald Trump. There is absolutely nothing in the national Constitution to justify an individual, not even the President of the National Assembly (a post that Juan Guaidó holds for one year) raising his hand in a plaza to proclaim himself interim president. Such a mechanism does not even exist in our national Constitution. At any rate, if we were actually without a President of the Republic, which is not the case now, the Constitution would require the holding of elections within a period not to exceed thirty days. Not calling for elections, but holding them. And this is not the case; this interim person is being proposed to have a permanent presence. So clearly, those EU countries that have recognized him are violating international law, because according to international law, relations are between States, not between States and governments. By acting in this way, these countries are succumbing to a blatant, vulgar, and legally questionable coup attempt; they are simply going along with the US policy of interference. It is nothing more than a coup d’état for regime change. We in Venezuela are going to use our government, our authorities, and our army to reject this foreign agenda—an attempt to openly truncate and violate out national Constitution. Alex Anfruns: Juan Guaidó was an unknown until very recently in Europe—and perhaps even in Venezuela. He uses Article 233 of the Constitution to justify his self-proclaimed Presidency. That interpretation by the Venezuelan opposition is spreading abroad. Is it correct that the Constitution has such a provision to demand a change of government? Claudia Salerno : No, it is absolutely wrong and false. Article 233 regulates absolute vacancies in the office of President of the Republic. None of those circumstances have occurred. The President has not died, resigned, or been removed by decree of the Supreme Court of Justice; the Court has not declared him to be permanently physically unfit, nor has he left office. So none of these situations has occurred. But even if any of them had, the Article is clear that if an absolute vacancy occurs before inauguration, that is, before January 10, the Presidency would be assumed by the President of the National Assembly. But that situation did not occur either, because Mr. Juan Guaidó proclaimed himself President on January 23. That is to say, long after the inauguration of President Nicolás Maduro. The second possibility would have been if the vacancy had occurred after the inauguration. The person who would have assumed the office of President in charge—and not “interim President” because such a figure does not exist—would have been the Vice-President or Executive Vice-President. In this case it is Ms. Delcy Rodríguez. No other situation is possible. Under the article of the Constitution that the EU, and Mr. Guaidó himself, are now using to argue that Mr. Guaidó is President, the person who would assume the office of “President in Charge”—which is not the same as being President—if there were an absolute vacancy, is Vice-President Delcy Rodríguez. There is no other interpretation. Now the EU is trying to give its own interpretation of the Constitution to suit its purposes. On the one hand, the EU says that there was an absolute vacancy in the office of President prior to the inauguration because it does not recognize the elections of 20 May 2018. The question everyone is asking is: if this absolute vacancy occurred when the elections took place, why did you wait so long to declare there was a vacancy? The National Assembly had more than six months to debate the issue. Why did it wait until January 23 to say there was no president? That shows that an agenda had been laid out for a perfectly structured coup d’état. The second question that needs to be asked is: Why does the EU say that Mr Guaidó can call elections within 30 days, 90 days, or a year? That is to say, when the conditions are met for those elections to please the EU… But what does the EU think? Do you think that any country in the world or group of countries could say to another “it seems to me that your Constitution means this…”? They only care about a few elements of Article 233 which they use as a justification. But it is clear that this article does not establish any basis for Guaidó to be doing what he is doing. That is why we must not disguise it. It is a coup d’état. They may cite an article of the Constitution to justify the coup, but if we analyze it, it is clear that there is no room for the interpretation that they are using in the National Assembly. Their betrayal of our homeland is so flagrant that yesterday they endorsed a law which would allow Guaidó’s term to be extended for 30 days every 30 days. It is renewable every month… A level of audacity you wouldn’t even see in an apartment lease agreement! They are settling in while they break the law to carry out a parliamentary coup. By the way, our system is presidential, not parliamentary, and it clearly establishes a separation of powers. Mr Guaidó now says that he holds the office of President of the Republic—the Executive Branch—at the same time he is President of the Legislative Branch. That is not possible under the Venezuelan Constitution, so the coup d’état could not be more blatant. Alex Anfruns: Venezuela is in fact not alone. It enjoys the support of many countries throughout the world that continue to recognize the government of Nicolás Maduro. So does the United Nations, which is defending international law. Foreign Minister Jorge Arreaza conducted a South-South Dignity Tour, defending Peace Diplomacy. Venezuela also has the support of many of the peoples of the world, including the American people who have shown solidarity with the Venezuelan people facing aggression. Amidst this situation, some countries such as Mexico and Uruguay have defended a different viewpoint during the Montevideo Meeting. How would you assess this dialogue mechanism? Claudia Salerno : The Montevideo Meeting concluded with the adoption of a comprehensive proposal endorsed by Mexico, Uruguay, and the member countries of the Caribbean Community, or CARICOM. CARICOM is an organization of 15 sovereign Caribbean countries that have decided to endorse a proposal called “The Montevideo Mechanism” which was born on February 6. On the international stage, this mechanism seeks to create a space for dialogue and peace among the parties, to find a solution to what they have called the “political crisis in Venezuela” – which has been promoted from outside. These countries of the Latin American region have already formed a coalition and presented a concrete proposal. This proposal on the table already has an agenda and a clear work plan with precise steps. The first step is an immediate dialogue to create conditions for direct contact between the parties. This was stated in the joint communique issued by CARICOM, Uruguay, and Mexico. The second step would be to negotiate and present the results of the dialogue, with common points and a space to allow an easing of each party’s position. The third step would be a commitment to and signing of agreements. And the last step of the mechanism would be implementation of the agreements with international accompaniment. This agenda is completely different from the EU’s agenda of interference, colonialism, and ultimatums. As is well explained in the Montevideo Mechanism, neither ultimatums nor deadlines are established. No prior agenda is established, nor are conditions placed on the elements that may form part of that debate. It is an open dialogue in which all interests and all topics are allowed in order to establish common points. I believe that at the moment the world is showing that the region of Latin America and the Caribbean wants to continue to be an example for the world. More than 10 years ago, while our Commander Hugo Chávez Frías was still alive, Latin America and the Caribbean was declared a Region of Peace. Something historic happened yesterday in Montevideo, a before and after for the Venezuelan people. While a group of countries from the North, with the United States accompanied by some European countries and some countries from the South American region, call for intervention, interference, forced solutions, and even continue pondering the possibility of an armed solution… a group of 17 countries, with the same weight and sovereignty that the United Nations Charter gives to every country in the world, delivered a proposal for open and frank dialogue with international accompaniment. The ball is now in the court of Latin America and the Caribbean. Alex Anfruns: Let’s get back to talking about the region. During a February 2 demonstration, Juan Guaidó asked his supporters in the opposition if they were prepared for a civil war, to which they replied that they were “not afraid.” He then announced the sending of “humanitarian aid” through Cúcuta. What is the Venezuelan government’s response to the active role that a neighboring country like Colombia intends to play? Claudia Salerno : It is regrettable that precisely the country to which a Venezuelan gave freedom and sovereignty, intends to use its space and its land, perhaps its weapons, to turn them against a brother people like Venezuela, which has only given Colombia its support and solidarity since the beginning of its history, and more recently during these sixty years of bloody war between Colombians. For Venezuela that meant a population of almost 6 million Colombians in Venezuelan territory fleeing their country. Children born in Venezuela who are Venezuelans, children of Colombian parents fleeing bullets and war. It is regrettable to see that a country that has suffered so much may be willing to lend its territory for an attack on a sister nation. We all know what “humanitarian intervention” means, which at the moment is simply a trick to intervene and penetrate Venezuelan territory. There is no recent case of the United States intervening for humanitarian or other reasons in any country, in which that country is now better off than it was before the U.S. got its hands and boots into it. It is a very difficult moment but one that fills us with courage, with strength to defend what is ours, which has cost us so much, and which has even given us our own name to the process underway in Latin America and the Caribbean. Venezuela has never raised its weapons against any people. The only time it raised arms was to give freedom to five countries in the Latin American region. Many of these are today brandishing their arguments – and possibly their weapons – against our people. But we will resist. We have done it before and we will continue to do it now. If we look back at history, Simón Bolívar gave us the greatest example of how a small country can defeat powerful empires. We did it two hundred years ago. We do not want to reach that stage. As a diplomat and as a politician, I would like to think that there is a time and a place for talking. That’s why I don’t like deadlines or people who say they reject dialogue. I believe that when there is no talking, there is nothing left. I continue to believe that peace has its place and we must give it room. Politics must be activated now. I am confident that this will be more powerful than those who are cleaning their cannons and preparing to enter our homeland by disguising themselves in food boxes. By the way, the U.S. is proposing 20 million dollars in aid. That doesn’t even cover 1% of the Venezuelan people’s needs in terms of food. It is absolutely clear that this is a hoax to disguise its true intentions. Mr. Guaidó himself said it blatantly: he doesn’t care if it costs lives. In fact, in a tweet that he later deleted, he said that he hoped “there would be as few deaths as possible.” He should be asked if any deaths at all would really bother him. I would like to see it resolved without any deaths. That is what leads those of us who take politics seriously act to responsibly. Claudia Salerno : In Venezuela we know that we have a very powerful enemy with enormous weapons and a great ability to exert pressure. But our dignity is bulletproof. If it comes to that, our forces are preparing to defend the country. The tragedy that the U.S. was expecting with intervention of the armed forces has not occurred. They have even been brazenly asking our soldiers to turn against the government and the people. What Chavez taught us and what we have built in the last 20 years, has made us resilient to those tactics. It has left us with tremendous cohesion around our national dignity and a willingness to defend what our liberating forefathers left us. We are not going to abandon each other. Alex Anfruns: One of the reasons invoked by the detractors of the Bolivarian Revolution is that the economic situation has provoked a phenomenon of migration of Venezuelans abroad, never seen before. What do you say to those who say that the Venezuelan government is to blame because it has not done enough to fix the economic problems and to those who say that there is a humanitarian crisis? Claudia Salerno : President Nicolás Maduro is the first to say and agree that not enough has been done, that we could have done more. Of course, we can always do more, that is the position of a responsible leader: to understand that there are shortcomings and needs, not to deny them. He does not deny them, he has taken them on. Given the exceptional circumstances that have befallen us, the national government through all of its ministries has tried to deal with our challenges and the crisis. There is one essential thing to remember whenever we talk about the economic crisis in the country, which is not denied by the President or any responsible government official. In 2015 Venezuela was decreed “an extraordinary and unusual threat to the United States.” That was under the administration of Mr. Obama, the Nobel Peace Prize laureate. From that moment until Mr. Trump landed in the White House, Venezuela has been subjected to a series of economic, trade, and more recently, financial measures, which have created a total and absolute blockade on the State’s capacity to use the trade and financial mechanisms required for international relations. Venezuela even had to circumvent the dollar to carry out commercial and financial transactions with other countries. We had to change the routes of bank transfers to ensure that the country would continue to comply with its debt payment obligations to countries that are not our creditors. And yet, despite three years of a fierce blockade that is becoming more and more radical, last week we had the outright theft – because there is no other way to describe it – of the US taking over the goods and assets of the Venezuelan people, which were confiscated in U.S. territory. Now they want to hand [our assets] over to the coup plotter Guaidó, as if it were a small box from the corner store. Those assets that belong to the State are being transferred—without any control and without the control mechanisms of the State, or comptrollership—into the hands of a man who one month and ten days ago was absolutely unknown to anyone in the country. Incidentally, he reached the National Assembly as part of the fifth ranking political force in the opposition. That is why he is the president of the National Assembly in fourth place after so many others. His political party was the one that got the least number of seats, it came in fifth place. In addition, little Mr. Guaidó’s cloak of legitimacy is 97,000 votes, which he obtained as a deputy in the Assembly. And he intends to use those 97,000 votes, with the support of the U.S. government, to capture and steal our State resources? Of course there is an economic crisis. No country could be free of economic pressure and administrative issues if all its resources and ability to do business with other countries were under siege. Alex Anfruns: What about migration? Claudia Salerno : Regarding migration, it must be made clear that this is predominantly the economic migration of professionals. Venezuelan migrants are almost certain to have completed secondary and advanced education. Those are the ones going to border countries and some others, for a total of 16 countries. They have left seeking better opportunities for themselves and their families. We can just compare the figures used by the United Nations, for example, with those used by Spain. I would like the government of Pedro Sanchez to explain to me, since it has been so critical of the current situation and has used the economic migration of Venezuelans to border countries as a flagship argument against the government of Venezuela… I’d like Sanchez to explain to me why Spain, which is not facing an economic and trade blockade, which is not facing financial measures to capture its goods, resources, and assets in U.S. territory and that the U.S. has not blocked it for 3 years, why have 1.5 million young Spaniards gone to other European countries, including bordering ones? He should explain why Spain has 1.5 million young people outside its territory, while he criticizes us over the numbers of Venezuelan migrants. And his figures are absurd. They say that 3,000 to 10,000 Venezuelans leave the country every day. It must be said that Venezuela is a country of 30 million. If those were the real figures, there would be no Venezuelans left inside. They are so brazen in their arguments that their numbers do not even make sense. It is clear that this is devised for a media campaign. When they are determined to take resources from other countries, they don’t mind lying. When they lie, they do so outrageously. It’s not the first time. They lied and they lie systematically. They lied in the case of Iraq, in the case of Libya. Why would anyone believe that they would tell the truth in the case of Venezuela? What makes them believe in governments that have already lost their credibility? When they intervened in countries for their resources, are they now going to tell the truth in our case? Isn’t it because Venezuela is sitting on the largest oil reserves in the world? And on almost the largest reserves of diamonds, gold, and coltan in the Latin American region? Or do they export their democracy to the most resource poor countries? So let’s not fool ourselves. There is a coup d’état afoot with a view to forcing regime change to take and appropriate the resources of the Venezuelan state. They have not even waited for the coup to work before starting to take away Venezuelan State resources in U.S. territory. This is how vulgar the situation has become. At the request of the United States, the UN Security Council convened 38 countries to take a position on Venezuela. Among those 14 voted in favor of the coup and 24 against it. They do not care. At the request of the US, the Organization of American States (OAS) met in Washington. They only got 19 voices against the rest. They were unable to adopt a decision against Venezuela at the OAS Assembly or at the UN Security Council. But they continue to act. This is not the first time they have done so. Meanwhile, the European Parliament, through a resolution, tried to recognize Guaidó, while it does not have the power to recognize a government. But that is not the first time they’ve broken the law. They did it in 2011 with the case of Libya. It’s not a new formula. That’s how brazen they are, they don’t even invent a new strategy. Against Venezuela they are combining all their recipes: that of color revolutions, that of Libya, that of Iraq… In Guaidó the United States has found someone happy to be a coup d’état puppet.